2018/Dec/18: New rule "Ver.3" applicable from January 2019 has been released. 2017/Mar/15: New rule "Ver.2" applicable from April 2017 has been released. 2017/Feb/4: New rule "Ver.1" applicable from April 2017 has been released. Koma entries shall be one for each competition and can not be exchanged once entered. If the Koma producer can not come to throw, organizer will choose substitute thrower. Koma for the competition (not refundable). Entry fee (as per organizers discretion). The diameter of the Koma shall be φ 20.000 mm (twentie millimeter) or less with respect to the spin axis in the stationary state. The total length of the Koma is 60.000 mm (sixty millimeter) or less in a stationary state. Verification of dimensions is done by the official ring gauge (inner diameter of 20.001mm) and a commercially available caliper. Turning with one hand only. Measurement of Koma is performed by the measuring officials appointed at each competition and responsible for the result of the measurement. The throwers face each other across the Dohyo ring (the cheering team shall wait at the position determined by each competition). Prepare to throw when referee calls "Miatte" (If throwers is not ready within 30 seconds, make 1 loss (Refer to 5-3)). Throw Koma into the Dohyo ring, when referee calls "Nokotta". Decide on winner and loser according to [5. Winning and losing]. Lose if the Koma goes out of the Dohyo ring or stops before oppnent. Match ends with 2 consecutive wins. When Koma is spinning, however the point of contact to the Dohyo ring is not spinning, will be 1 loss. When thrower is not ready to throw within 30 seconds after refree calls "miatte", will be 1 loss. The deformation of the Koma before referee calls "Hakkyoi Nokotta" (before throwing the Koma into the Dohyo ring) is prohibited, and will be 1 loss. The deformed Koma where the diameter and the total length change during spinning, it must return to the original shape when stops spinning. If fails, thrower receives 1 loss regardless of the state of the opponent. In the case of obvious delayed actions, unsportsmanship act or disturbing behavior, thrower may receive 1 loss by discretion of referee. Throwers can make a complaint when there is a question on the judgment. Then referee makes the final decision. Koma that spins at two or more points of contact to Dohyo ring are prohibited. Koma that changes spin axis are prohibited. Changing or modifying parts/modules after the entry is prohibited. After entry, it is prohibited to touch the Koma until your turn to throw. Use of auxiliary tools to assist / encourage spinning of Koma from the outside is prohibited. Motorized Koma is prohibited at competition grade G3 or above. Tool to deform Koma is prohibited, except repair and restoration. Until the first round of battle, Koma will be kept in a case prepared by organizer. Your specially prepared Koma case can also be used. φ250 millimeter 凹R700millimeter. Made of Chemical wood. Winner takes home all the loser's Koma. This rule may change even in the middle of the term. The deformed Koma where the diameter and the total length change during spinning, it must return to the original shape when stops spinning. If fails, thrower receives 1 loss. Specially prepared Koma case can be used until the first round of battle. The diameter of the Koma shall be φ 20 mm or less with respect to the spin axis in the stationary state. The total length of the Koma is 60 mm or less in a stationary state. 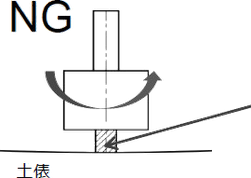 Verification of diameter is done by official ring gauge and length is done by commercially available caliper. [Rule detail] with easy to understand illustration. 3-1.The diameter of the Koma shall be φ 20.000 mm (twentie millimeter) or less with respect to the spin axis in the stationary state. 3-2.The total length of the Koma is 60.000 mm (sixty millimeter) or less in a stationary state. ＊Koma spin axis and the center of Koma shall not necessarily be the same. ＊You can leave the protective cover during a gauge check if Koma with sticky surface, make sure to remove the cover (ready to battle mode) when you test and check the Koma prior to battle. 5-1.Lose if the Koma goes out of the Dohyo ring or stops before oppnent. Match ends with 2 consecutive wins. When spin changes its direction. It will consider as 1 loss. 5-2.When Koma is spinning, however the point of contact to the Dohyo ring is not spinning, will consider as 1 loss. ＊If this part is not spinning, it will be 1 loss. 5-4.The deformation of the Koma before referee calls "Hakkyoi Nokotta" (before throwing the Koma into the Dohyo ring) is prohibited, and will be 1 loss. Please note that the deformation of the Koma before throwing is 1 loss. 5-5.The deformed Koma where the diameter and the total length change during spinning, it must return to the original shape when stops spinning. If fails, thrower receives 1 loss regardless of the state of the opponent. If the shape of the Koma after spin does not return to the original shape, it will be 1 loss. 6-1.Koma that spins at two or more points of contact to Dohyo ring are prohibited. Following example shows the types of 2 point contact, these will be 1 loss. However, unintentional contact due to the sticky Koma surface or being bounced off by opponent are not subject to 1 loss (at discretion of referee). ・Even at the tip of the shaft, following example is subject to 2 point contact. ・ Another part such as a cover will also subject to 2 point contact. 6-2.Koma that changes spin axis are prohibited. If Koma continue spinning while changing the spinning axis, it will be 1 loss. 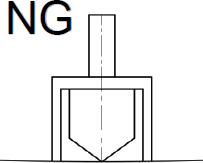 6-3.Changing or modifying parts/modules after the entry is prohibited. ・Replacing parts after gauge chack is prohibited. ・Adding parts after gauge check is prohibited. 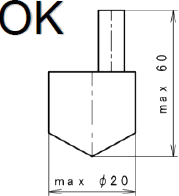 Note: Below two examples are accepted as long as the diameter is φ20.000 mm and the total length is 60.000 mm or less in a stationary state. ・Recompose parts within a same Koma (Must maintain the height and diameter specification). ・Height or diameter change (Must maintain the height and diameter specification). 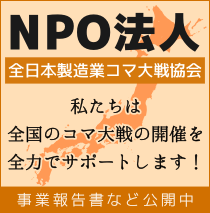 Copyright(C) 2012-2019 NPO法人_全日本製造業コマ大戦協会. All Rights Reserved.